The very nice people at OXO TOT UK saw my post about being out and about and sent Dexter some food and drink items to review. We were challenged to take these items on our travels and really put them to the test. Most weekends we like to do at least one thing that will take us out of the house so time is spent both in the car and on foot. And now Dexter is older we don’t bother with the pushchair either, so everything has to be carried. 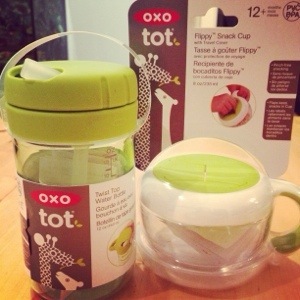 OXO TOT UK sent us a green twist top bottle that has a soft straw inside and a green flippy snack cup. I’m not a fan of the traditional blue for boys, pink for girls so was impressed with the lime green option. 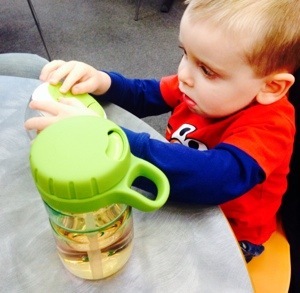 The cup is new to their range and has a handy loop-thingy so little hands can carry it easily; we even used this to hang the cup from our rucksack. Both items passed the sitting-in-the-back-of-the-car-unattended test and Dex did not shower himself or the backseat of the car in juice, mainly because he couldn’t open the bottle, nor did it leak if turned upside-down. 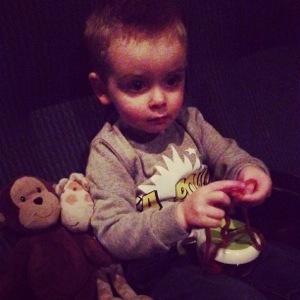 The snack cup kept his little hands busy during a trip to the cinema and I filled it with a mixture of naughty and nice treats. And FYI the colour was very useful to see in a dark cinema when Dex dropped it on the floor. And no contents were lost! We also got a few interested looks whilst on a playdate when I pulled both items out of my bag, although this might have been because I accompanied the action with a drumroll. I take this reviewing malarkey VERY SERIOUSLY, don’t ya know. We have a cupboard full of feeding apparatus that have been collected over the years. Dex has his favourite few, as do I. My favourites are the easy to clean variety, both of these items passed that test. I like an item that you can pull apart, wash thoroughly and don’t need a Masters to put back together. So all in all we are fans of both items. They are sturdy, nice to look at, easy to clean, easy to carry and do not make your iPhone or diary soggy in your bag. Winner!! Disclaimer: Dexter and I were sent the OXO TOT UK items to review and share our opinions about on this blog. Everything written above is my own rambling thoughts, with some serious input from Dexter. The perfect present for your tot that’s brilliant for lunchtime or on the go. The secure lid avoids spills in backpacks and lunch boxes when not in use, and a simple twist of the non-slip lid reveals a soft straw that’s comfortable to drink from, while another twist closes the lid again keeping the straw clean and germ free. The large opening makes it easy to fill, plus there’s a discreet dimple in the middle of the bottle that provides a gentle grip for small hands. Suitable from 2+ years. £8. Available from Amazon. Keep tiny tummies topped up, whether you’re on the go or at home, making life that little bit easier for tots and parents alike. The soft, comfortable opening provides easy access to snacks, while the unique flaps are designed to create a snack-trap, keeping food inside and floors clean. £6. Available from Amazon.